I couldn't have asked for much more. 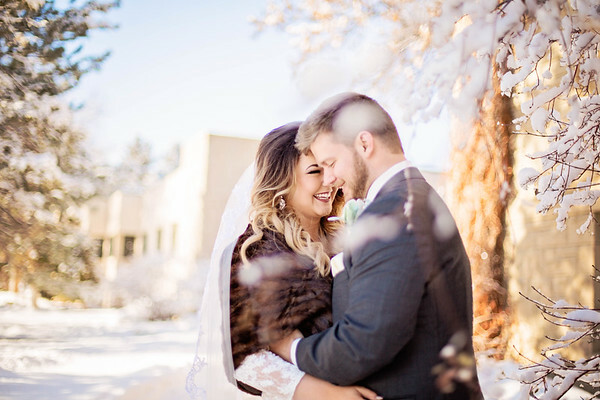 A New Year's Eve wedding, 30 degrees, beautiful snowfall from the day prior, a glowing bride, and a groom with stars in his eyes the moment he saw her! This took place at the Historic Billings Depot in Billings, MT. The first look was full of raw emotion and even I choked up as they embrace one another on the day of their wedding. The entire time I was photographing this couple they were whispering sweet nothings and just wrapped up in the happiness of the day ahead of them. Not to mention they were great at cuddling close in the 30 degree weather! The day before was a blizzard and much colder, so we were all relieved to have the weather that we did. The sun was shining and the wind was nonexistent. The wedding party met up with us in their party bus at Rocky Mountain College, where the two attended for their degrees. What a beautiful cactus filled with amazing classic buildings and towering pine trees. We had a quick session with a giant wedding party-10 on each side! The snow was chilling for these girls in their stunning various dresses and open toe shoes! We then headed to a local Brewery for a few drinks and snacks...where the bride thoughtfully wrote her vows...on a napkin! Nothing like the present! One of the most special things about the day was the fact that it was the first time a historic mirror was used in the Depot for bride's. A local craftsman put together the mirror from wood from the area and gave it to the Depot so that every Bride married there could have a piece of history as a part of the wedding day. McKenzie was elated to have her photos taken with this beautiful custom mirror. The ceremony was filled with family and friends, and dare I say, lots and lots of laughs. These two are full of personality and it was such a joy listening to stories of their meet up and future life together! In true Montana fashion, the two combined their favorite beers in a mug in show of their unity. What a unique way to pledge yourselves to one another! The ceremony was followed with a stunning dinner, open bar, and lots of joy. Toasts were given and there was no shortage of teasing or tears. The dance floor soon lit up, with a garter auction reaching upwards of $2,000! I've never been a part of an auction at a wedding, and I hope every future wedding adopts this tradition...what a hoot! The New Year rang in the newest couple to date, and I am so honored to have been a part of it. These two were as sincere and beautiful inside as they are outside. I loved every moment of my time with them and their families, and I wish them the best in the years to come!